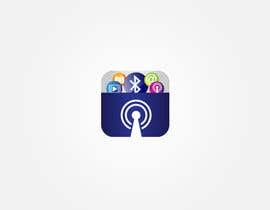 We working on Mobile App Applications. Hi all thanks for all the work. please check #172 , #173 , #176 , #177 , thank you! OK freelancers so far NoLogo,infotrine and fivezoes did good job. 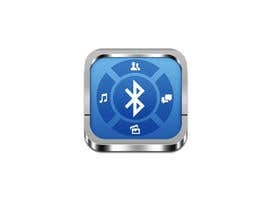 But still i have got only one icon design i want other three icon designs as well. 3 days left. As soon as client made his decision i will announce winner. Thank you and good luck! Hi, Please check #114 , #118 , #124 , #125 , thank you. Hi, Check #95 , design by Illustrator CS5 in 2048x2048, you can see the preview as small like 72x72, waiting for reply Boss. 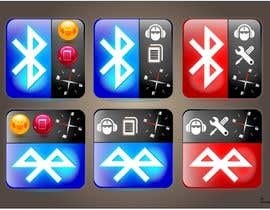 Hi, please check #46 , and give feedback, I have tried to fulfill your requirements for Bluetooth communicator, my icon has unique look as it is made with use of 3D to make it stands out, looking forward for your feedback, if you like it, i will make other 3 with same kind of 3D feel. Please check #46 . Thanks. 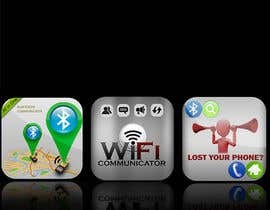 Do not use phone,Bluetooth and WiFi signs in one button. 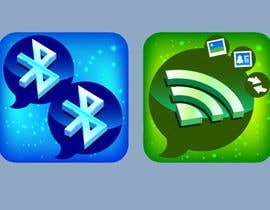 These are 4 separate icons. 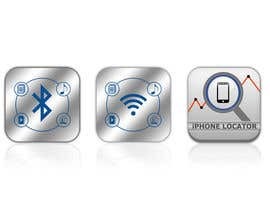 Like for "Bluetooth Communicator icon" use Bluetooth sign and it would be nice if you can somehow give little feel of what the app actually does, like contact, photo, text, note and voice sharing between iPhone, iPad and iPod touches. But not like that its already done. Be creative use colors. Probably you can somehow use them in the background or any other way that you may find suitable. Good Luck! Use colors to incorporate app features in icon. Blue color is not necessary. Be creative! I didn't get what you need! 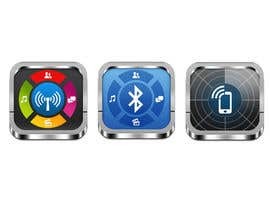 Only one icon, 4 icons, logo or all of them? Hello CH.. you are the designer. then why the contest ? Yes but am not that good in App icon designs. So am looking forward to you guys. Really hunger for someone to come and understand what i want and wow me! Please check out and give feedback for #33. Thank you. Do you need ALL IN ONE also written in logo ?? Hello CH, kindly confirm is it one icon denoting the 4 logos? Or 4 separate icons ? 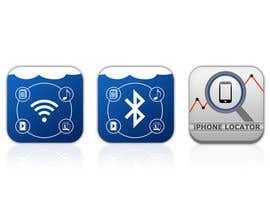 4 separate icons. Please check provided links for reference in "Detailed requirements". Please have a look #13 . Please have a look #12 . Please have a look #10 . Please have a look #8 .
let me know improvements or is this right direction about what is it in you mind?? Please have a look #7 . Please have a look #1 , #2 , #3 .